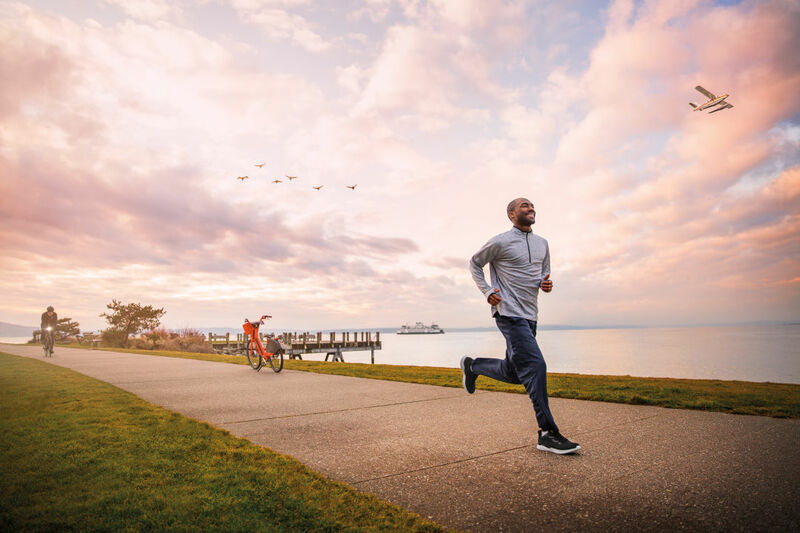 Discovery Park paths marry a hearty workout with killer Puget Sound views. Photo by Mac Holt. Who wouldn’t want to work here? Lake Union’s trail is named for a carver who lived on the lakeshore. When Seattle’s Native American population had been nearly all swept out of town, a man named Cheshiahud remained in his small cabin on Portage Bay. 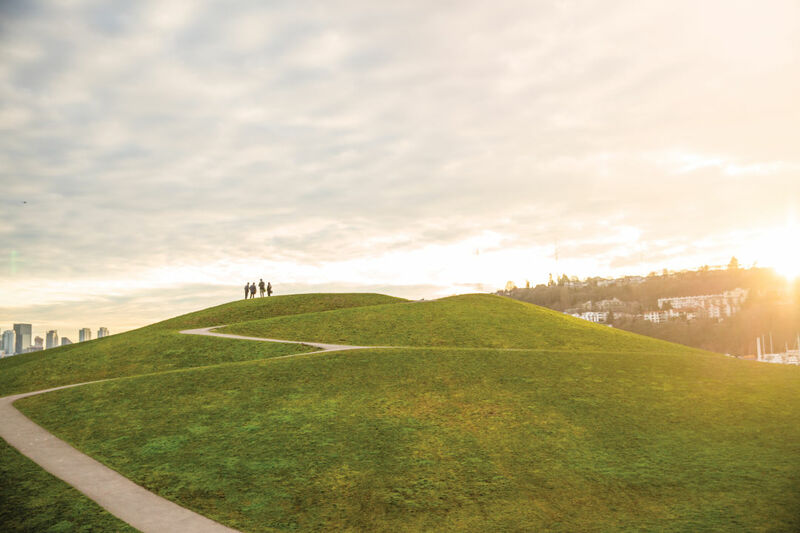 The mostly paved path that rounds Lake Union is named for the holdout, a full circle around the city’s central body of water, one molded by the people who settled around it. The route is a hit list of some of the city’s best attractions—MOHAI, two draw bridges, Gas Works, Fremont’s many statues. Riding around Lake Union is the best way to appreciate how its three-lobed structure was shaped by the Ship Canal, a waterway that was dug through the area while Cheshiahud carved canoes on the shoreline. A brown rabbit, its ears posed in perfect storybook form, munches on a carrot next to an iron pedestrian bridge that crosses the Duwamish about a mile into the Green River Trail. The root is thick and orange and almost definitely left here for the rabbit by workers in the nearby office park; this is a landscape of brambles and garbage piles, not vegetable patches. But this slice of the bucolic isn’t so unusual along the Green River Trail, even as it traces the languid river in South Seattle’s most industrial acres. For nearly 20 miles of paved pathway, bikers and walkers get to see Seattle’s gritty heart next to raw, unfussy nature. Riding south from Seattle toward the trail’s end in Kent, the recovering Duwamish quickly becomes the suburban Green River, lined with a thick ribbon of vegetation that reflects the season—wide with bloom in the summer, but with its own stark beauty in winter. Signs of humans are everywhere, but it never takes long to see, say, osprey in the trees or rabbits along the grass. Already one of the region’s longest contiguous trails, the Green River route could grow in both directions in coming years thanks to a proposal that would inch it a little north into South Park, then unfurl it about 10 miles southeast to Flaming Geyser State Park. The flat, easy pedal darts back and forth across the waterway, popping into greenbelts and neighborhoods, numerous city parks and under interstates before always returning to a river that has been Seattle’s backbone since the city was born. Want to give a Ballard resident a headache? Bring up the long debacle around rerouting Seattle's most popular trail. The Burke-Gilman's so-called missing link, a dedicated bike and pedestrian path along Shilshole Avenue, would connect the two sections of a route that has traced an old railroad line since 1978. Currently, Central Ballard stands between trail sections short (the part that rolls past Ballard Locks) and long (the part that goes all the way to Bothell). As recently as spring 2018, it seemed like the long-discussed, mile-and-a-half link would be constructed. The plan survived environmental impact studies and a design committee that included local business leaders. But then tempers flared between the city council and local industrialists; council member Mike O'Brien got into a scuffle with a shipyard owner. The business owners didn't want their delivery and oil trucks tangling with cyclists on Shilshole. And in December, a Superior Court judge ruled that the city hadn't fully addressed the economic impact of the link, and construction was halted yet again. Alternatives to Shilshole, like Leary Way, were proposed. The saga continues. But that mile and a half of not-yet Burke-Gilman, three decades in the making, is just a blip in the well-loved route. Commuters use it on weekdays, yet it belongs just as much to pleasure cruisers along the Ship Canal or wine lovers pedaling toward Woodinville. Since it moves east–west, it's a tour of the city in a single ride, accessible and enjoyable to both seasoned and newbie cyclists. Seattle loves its signature trail, missing piece and all; maybe someday we'll get to love the whole thing. Everett has always felt like a Northeast city, more Pittsburgh than Pacific Northwest. Maybe because it was founded by eastern industrialists, including quintessential East Coast tycoon John D. Rockefeller. What was once a mill town is now a Boeing hub, a naval station, and a working port. Launched in 2018, the Mill Town Trail is meant to show off that history, though for now it’s mostly just signs along the streets and bike lanes that hug the city. 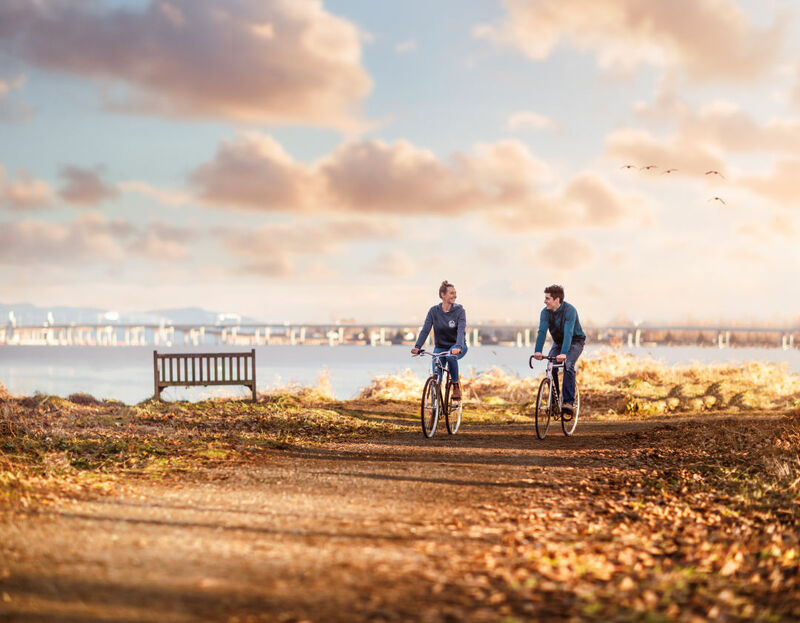 Cyclists and pedestrians peer over the flat metal roofs of Everett’s industrial acres to the white-topped Cascades beyond, then circle toward Puget Sound for views of the Olympics and low-slung Jetty Island that shields the waterfront. Eventually the trail may include interpretive signs, but for now there are just anonymous rail cars and old smelters, the sites of old shingle companies and the giant naval ships docked in rows beyond them. As history shaped Everett, one thing has always remained the same: This is a town that means business. 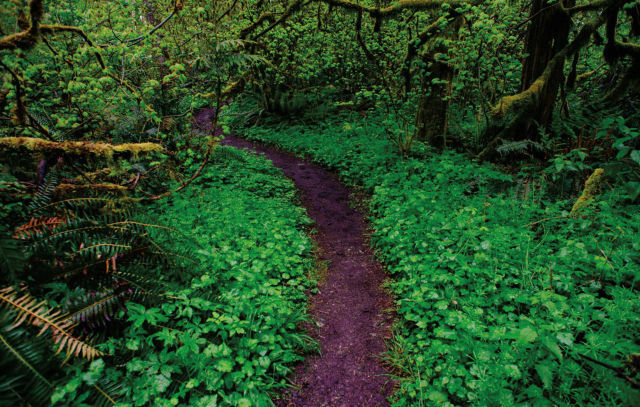 The quietest city trail you’ve never heard of is in Union Bay Natural Area. With the University of Washington and its towering stadium on one side, the Union Bay Natural Area manages to hide in plain sight, yet it holds 74 acres of marshy lakefront habitat on the shores of Lake Washington. Unlike the manicured Arboretum, the refuge has a natural feel with drooping branches over its trails and cluster cattails in the wetlands. The Yesler Swamp is prettier than it sounds (other less-than-lyrical names for this area: the Montlake Fill and University Slough). There was once a sawmill here, but now it’s a boardwalk overlooking lily pads, with more wildlife than city life; more than 200 different birds have been recorded in this tiny urban oasis. You can be excused for thinking the Interurban is everywhere; it kind of is. Built on top of old trolley and train tracks, two Interurban trails form a kind of car-free I-5 that travels up and down King County. 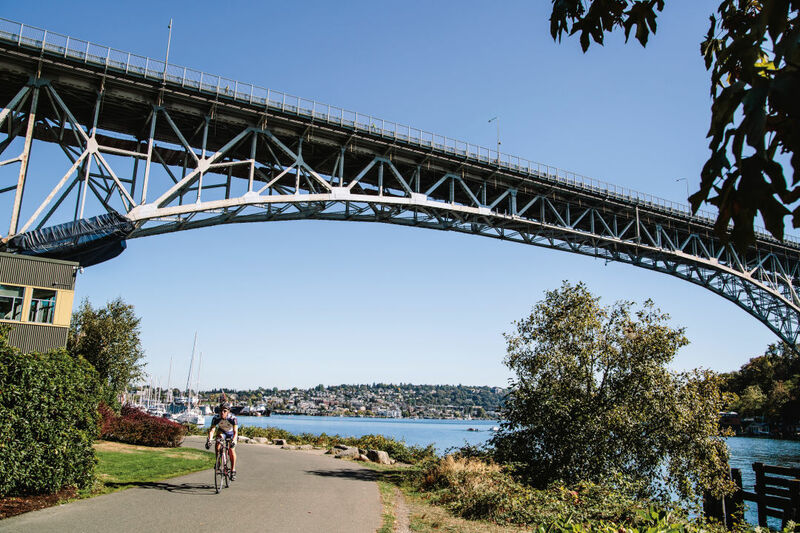 The better-known North section is a combination of protected bike lanes and paved trail until it reaches the county line in Shoreline, where it begins more than 18 miles into Everett. On the south side, 14 miles shoot through Kent and Auburn. It’s hard not to miss the commuter trains that once ran these tracks—public transportation 1920s style!—but the long, flat bike routes are a welcome trade-off. Some of the best views into the Sound are on the North Beach Loop Trail, rebuilt in 2014; harbor seal sightings are common, and killer whale cameos are rare but thrilling. The blackberry brambles on the Loop Trail near the north parking lot offer a snack in late summer, a good spot to pick fruit to bake a pie. Hello, second date. A visit inside the park’s Daybreak Star Indian Cultural Center is free, offering a chance to view the building’s blue jay sculpture and whale painting—plus the Wolf Tree Nature Trail outside has several reflecting ponds to appreciate a joint reflection. If a sunset from the West Point Lighthouse (where the North and South Beach Trails meet) doesn’t ignite sparks, it’s a sign. And not the good kind. Though not as wild as the name Cougar Mountain Regional Wildland Park suggests, the Eastside's big hill offers forested trails mere minutes from the interstate. In December, access got even more secure when the county finished deals to protect an additional 154 acres adjacent to the existing park. As part of the county’s Land Conservation Initiative, the move keeps development from encroaching on areas served by the county’s Trailhead Direct bus plus sections of May Creek Valley on the mountain’s southeastern side. Miles of trails weave throughout the 3,000 acres of Cougar, thick forest filled with streams and waterfalls, restored meadows and even old mining equipment. There are few places so green and so close to the city; now the public’s holdings got a little bit bigger. Don’t cry for Sammamish, the forgotten lake among greater Seattle’s many bodies of water. It’s got the sprawl of Lake Washington with just a fraction of the traffic on its shores. The immaculate trail up the eastern shore passes right by the houses that boast waterfront access, with peeks into the strange styles (Italian Renaissance, really?) and architectural shapes built here. Gawk at guesthouses, long docks, odd cupolas and the modern angles of newly built additions; occasionally the trail itself gets the waterfront real estate, but it’s mostly tucked neatly between houses and the parkway. Sure, the trail is lined with fences to keep trail travelers from private property, but the short wooden rails can’t keep out a curious gaze. Streissguth Gardens offers verdant bonus steps after long laps on the Howe/Blaine Stairs. Seattle is famous for its outdoor staircases, tucked into almost every neighborhood that has an incline (so, all of them). These are our five favorites. The city's favorite outdoor gym: two parallel staircases on Capitol Hill, one of which is the city's longest, while the other hugs the fragrant Streissguth Gardens. 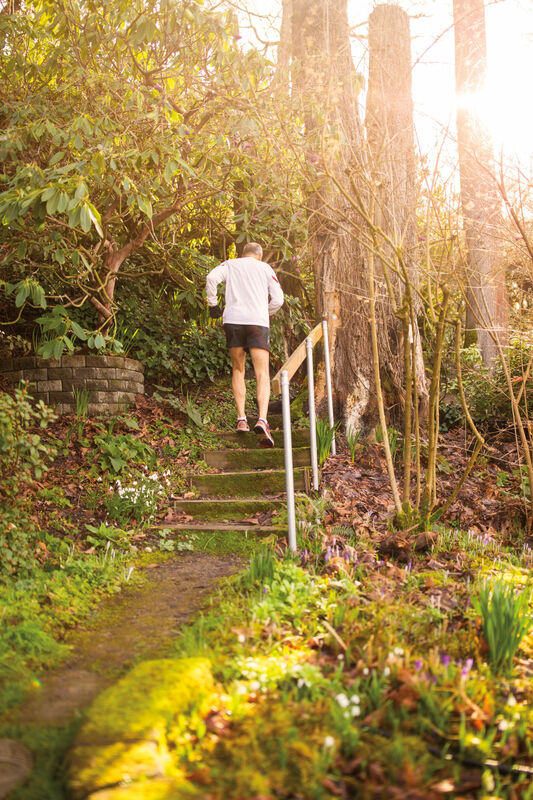 Descend to Fauntleroy's Lincoln Park through a green tunnel of stairs—the city's second most outdoor steps in a row—with wooden railings. Just east of Northgate, steps move down to free-flowing Thornton Creek, lined with interpretive signs about the watershed. As austere as the most classic Queen Anne Hill architecture: A retaining wall gets fancy with red brick designs and three flights of stairs. From the top of this modest Rainier Beach staircase—its 218 steps ideal for a workout—Mount Baker appears in the distance; down lower, Lake Washington pops into view. Runners are such a special breed—they love pounding out the miles, and they’re not afraid to proselytize to those of us who think it sounds as much fun as doing taxes. So at the Squak Mountain Bullitt Fireplace trailhead I eye the packed dirt trail warily as I tie my sneakers, ready to try trail running for the first time. Like a forgotten middle child, Squak sits between the more popular Cougar and Tiger mountains in Issaquah, and is laced with 19 miles of trails in a state park surrounded by King County lands. It’s less than two miles to the site of an old cabin, but the low hill demands little elevation gain. It seems like the perfect spot to try the growing sport (hobby? punishment?) of trail running. I jog through airy forest, where midwinter sun penetrates the tree cover to reach the carpet of ferns below; even on a dry day there are sections of mud that slow me—short inclines and rooty trails drag my pace, too. But Squak’s wide, well-signed route to the Bullitt Fireplace is as welcoming as forest paths get. It’s no wonder Evergreen Trail Runs uses the mountain to host 10K, half marathon, and full marathon races in early April. The remains of the Bullitt cabin only date to the 1950s, but the mossy stone chimney feels much older, a ghostly remnant cradled by thick brush near the top of Squak Mountain. Standing at the two-story ruin invites calm into what was a knee-pounding workout; that, more than the calories burned, feels like the real reward. I find myself choosing to walk more than run on the return trip, even though it’s an easy downhill; maybe it’s to prolong the green embrace of Squak Mountain, its earthen acres that seem to absorb every distraction. And also to save my poor joints. An Anna's Hummingbird attends to her Marymoor nest, while a dog finds himself in the tall grass. They don’t seem like an obvious pair—wild birds and domesticated dogs. But in Redmond’s Marymoor, they’re next-door neighbors in one of the best natural enclaves in the greater Seattle sprawl. In the middle of the park, the 40 acres for off-leash canines crisscross with mulchy paths that head over tiny spans bridging marshy streams: Old Dog Bridge, Soggy Dog Bridge, Dog-On-It Bridge. With baskets of free balls to fetch at the entrances and no leashes required, it’s a haven for hiking with pets that need to bound and frolic out some excess energy. And then, on either side, more subtle creatures: Small interpretive loops are maintained by the Eastside Audubon Society as birdwatching routes. Grebes and herons settle on the lake; finches hide in mounds on the ground; eagles and osprey land on the trees above. More than 200 species have been spotted throughout the park, but one needn’t know the black-headed grosbeak from a Swainson’s thrush to enjoy a calm ramble through the loop’s thicket, meadow, and riverside trails. Dogs are even welcome in the bird-heavy areas that encircle their 40-acre playground, provided they don a leash and refrain from treating yellow warblers like yellow tennis balls. 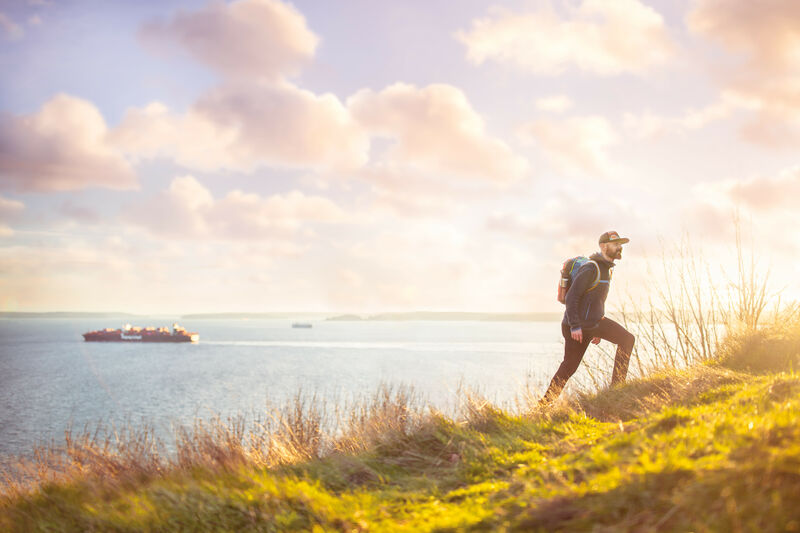 Chief Sealth, the Duwamish and Suquamish leader who greeted our region’s first white settlers, likely wouldn’t know what to make of the route that bears his name—but in under five miles, he’d learn a lot about the city that shares it. As the paved trail winds under power lines from Beacon Hill to Rainier Beach, it opens views to the VA hospital and the Renton Boeing plant, the snow-covered Olympics and placid Lake Washington. Small planes seem to buzz those lines on their way to Boeing Field, and P-Patches with tiny fences and gardening lean-tos look like hobbit villages. A short grassy, uphill stretch in the middle is a shame simply because the route is otherwise wheelchair accessible. Head north to south if you have a choice, since the southern end is next to the 20-acre Kubota Garden, a free and secluded haven of Northwest plants presented in the traditional Japanese manner. The manicured walkways might be novel to Chief Sealth, but he’d probably feel right at home between the tall cedars and spring-fed ponds that muffle the sounds of modern life. 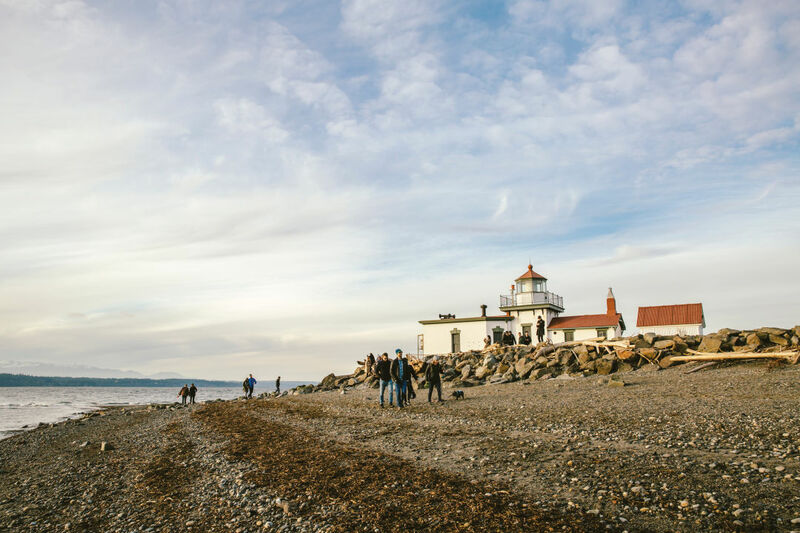 Racing the tide: Alki offers one of the city’s many waterfront routes. The kind of city skyline views that make it into NFL telecasts and Grey’s Anatomy episodes. The tips of the pilings that held Luna Park, Seattle’s own Coney Island–style amusement park that lit up West Seattle until 1913. The tiny heads of divers in Seacrest Park Cove 2, hoping to spot a giant Pacific octopus. A tiny replica of the Statue of Liberty, focal point for both protests and patriotic celebrations. Shirtless volleyball (for that one week in late July); be-fleeced volleyball (the rest of the time). Seattle dining institutions like Marination Ma Kai, Top Pot Doughnuts, and Salty’s. A pillar to mark the landing spot of the Denny Party, the first white settlers in Seattle, plus a plaque that recognizes the Native American people who greeted them. One of the city’s two legal bonfire sites, and plenty of sooty sand to prove it. A full day on Alki Trail starts with sunrise over the city skyline and ends with sunset by a beach fire. It sure looks like a road—wide, paved, white line on the edge—as it wraps around Tacoma’s Point Defiance peninsula, but in the morning Five Mile Drive changes personalities. Its outer loop is closed to motor vehicles until 10am (1pm on Saturdays and Sundays), allowing cyclists and joggers free rein from the zoo and its new aquarium to Fort Nisqually and its historic reenactments. And the Japanese Garden. Oh, and the dog park, marina, rhododendron garden, and beach access. In short, there’s more to do in Point Defiance than can fit in a single morning. Foot-only unpaved trails in the park go as long as 4.5 miles so there’s room to stretch one’s legs any time of day. 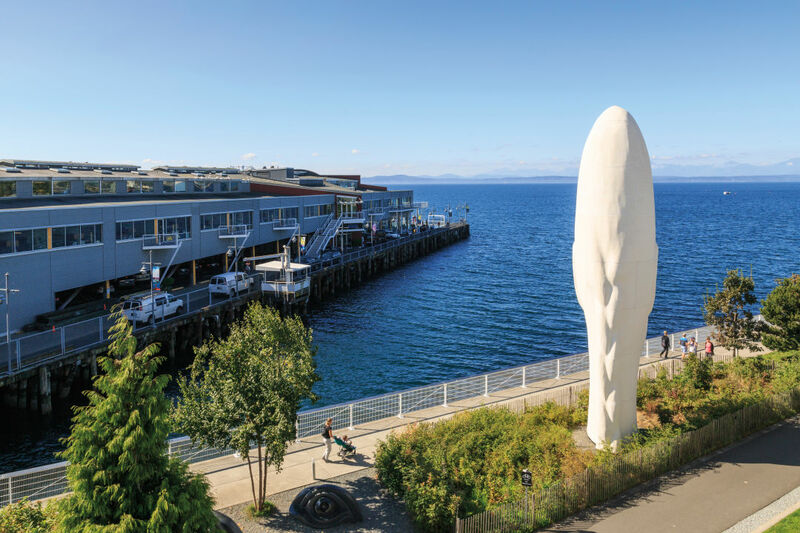 Big Head Odd: Artworks line the Elliott Bay Trail near Olympic Sculpture Park. It isn’t long, but our waterfront route is the little trail that could—and won’t quit. Constant construction in Interbay blocks it now, thanks to the Expedia campus that’s currently undergoing renovations along Smith Cove. A detour robs pedestrians and cyclists a bit of the view; those on foot get rerouted over footbridges and those on bikes ride down Alaskan Way. But on the paved path there are vistas to spare across Elliott Bay, up the North Pacific Coal Bunker trestle, and in the gardens of Myrtle Edwards Park.